After featuring nail art for the Zoya Bubbly collection, I felt it was only appropriate to feature nail art using the Zoya Tickled collection today! Again, I wanted to go for a fun and funky feel and with these shades from the collection, it was not a problem! 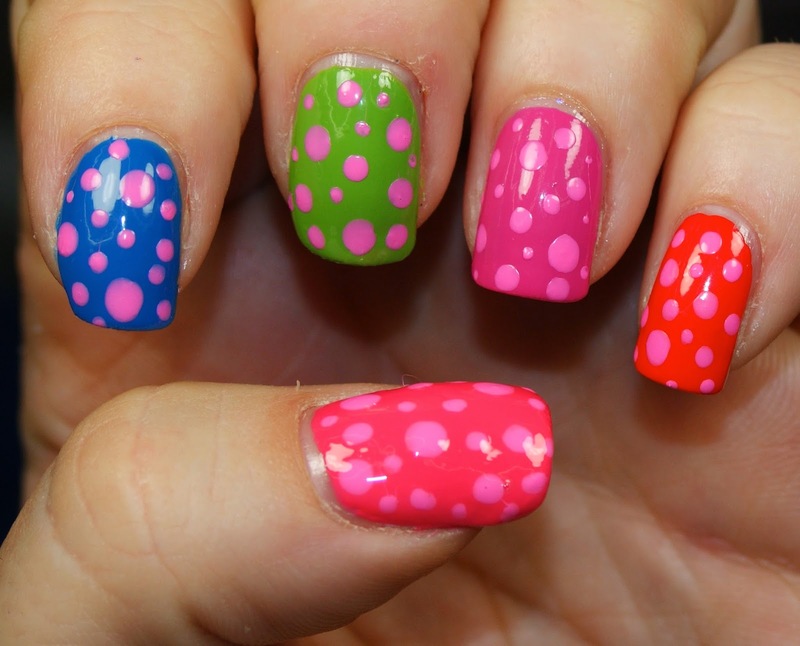 All polka dots were made using Zoya Kitridge. From thumb to pinky finger, the shades in order are Wendy, Ling, Tilda, Rooney, and Rocha. Zoya Kitridge is a summer bubblegum cream. Zoya Ling is a vibrant royal blue cream polish. Zoya Tilda is a warm mantis green cream. Zoya Wendy is a juicy summer melon polish. Zoya Rooney is a mid-range magenta pink cream. Zoya Rocha is a folly red cream polish. All of these polishes were opaque with two coats, while Kitridge was fairly opaque with one coat for the dots, so I imagine it would be opaque for full coverage in two, as well. The entire Tickled collection is available at Zoya.com for $9 per bottle. You can also find Zoya at your local Ulta store. Are you going to be picking up any of the Bubbly shades? And do you love these as much as I do?